There has always been one thing standing in the way of me cutting back on my consumptions of sweets. It is chocolate. If you are anything like me, chocolate is one of those things that I probably couldn’t live without. However, you don’t always have to feel guilty after eating chocolate. Taza Chocolate is one of those chocolate options that I can actually feel pretty good about eating. If you love chocolate as much as I do, finding that good tasting, yet healthy chocolate bar is your life dream. So the question is, is Taza Chocolate the chocolate for you? Personally, I like a good variety in my chocolate. Hopefully this review of Taza Chocolate Mexicano Disc Sampler will give you a good feel for what to expect when you order it. Honestly, it’s chocolate, so I just assume you’ll order it. People consume over 7 million tons of chocolate each year. That is an insane amount of chocolate. That means that it is likely that you ate around 2 pounds of chocolate last year. The chocolate we commonly eat is sugar heavy and diluted with tons of additives and sweeteners. That is what really makes chocolate so bad for you. There are chocolate options out there for those of you who want to have healthy options for snacks though. Taza Chocolate Mexicano Disc Sampler is a really good choice because you get a good amount of different flavored chocolate at a pretty decent price! Everything about Taza Chocolates resonates with a product that I would like. They do all of their business with a direct trade model which means they are not exploiting the cocoa bean growers. In fact, Taza Chocolate claims to be the first American chocolate company to participate in direct trade with cocoa growers. To top it all off all of their chocolate is organic. All of the ingredients in the Taza Chocolate Mexicano Disc Sampler are completely organic and come from direct trade. Taza Chocolate has a passion for the environment and those who are growing their chocolate. They also have a very unique chocolate disc that is inspired by Mexican chocolate traditions. Their chocolate is stone ground. All of the cocoa beans are ground on a giant wheel of hand carved granite. They claim that this creates a more bold chocolate flavor. Each ingredient in the Taza Chocolate Mexicano Disc Sampler creates a very different chocolate experience from what you might be familiar with. They have chipotle chili, cinnamon, coffee, guajillo chili, super dark, salted almond, vanilla, and cacao puro flavors in the Taza Chocolate Mexicano Disc Sampler. That means that you will get your standard, dark chocolate snack, but you will also get a lot of different flavors that might be a little bit of an adventure. The cocoa bean is usually dried, separated from their skin, and then they are ground into a paste and then melted down into liquor. When it says cocoa beans here, I assume that they mean the solids of the cocoa bean, but they may also mean the liquor itself as a whole of solids and butter. The paste is usually separated into solids and cocoa butter, but it can also be allowed to solidify again into raw chocolate. Organic cane sugar is a less processed form of can sugar than the white sugar you see. Less processing leads it to have a darker color. Otherwise, there isn’t much that is very special about organic cane sugar other than the fact that it is organic. There are tons of types of chocolates in the Taza Chocolate Mexicano Disc Sampler. That means that you will be getting ingredients like chili powder, almonds, cashews, cinnamon, salt and vanilla. All of these ingredients are still certified organic and just add to the variety of flavors you get to have. If you want chocolate to be a good snack, the first thing to remember is that you have to eat it in moderation. Even traditionally healthy snacks are not great if you eat too much. If you are seeking to have this chocolate to curb your cravings, then you’re in luck. The Taza Chocolate Mexicano Disc Sampler is the perfect bar if you want to eat just a few squares and feel like that is the right amount. Dark chocolate is full of a lot of really good nutrients to support healthy immune and circulatory systems. But if you eat too much, the sugar will outweigh the benefit of the nutrients. Other ingredients such as the high density of cocoa, help prevent heart disease. However, these benefits can only come from a really dark chocolate with a high density of cocoa. There are some dark chocolate options in the Taza Chocolate Mexicano Disc Sampler, but you get a lot of other chocolate options too. However, if you want dark chocolate specifically, this might not be the product for you. 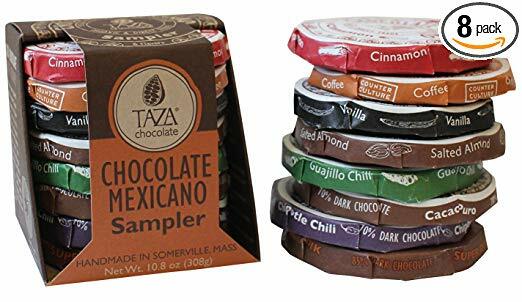 Taza Chocolate Mexicano Disc Sampler is a super highly rated product on Amazon. With 790 reviews, it holds a rating of 4.1 stars. That is a really good rating. Most of the reviews are really good and they say that this is really the product for those who want to try Mexican chocolate. I thought that was funny considering this chocolate is made in Maine. Some reviewers even say that this is their go to chocolate for making hot chocolate. The chocolate, which is stone ground, ends up being really gritty, but it tastes very sweet and natural. Any negative reviews have been complaining about the price of the chocolate. However, all of the other chocolate bars that are of the same quality will usually cost about this much or even more. Other negative reviews are complaints about the packaging and delivery. Everything about the product is extremely positive. Taza Chocolates was started by Alex Whitmore when he tasted chocolate in Oaxaca, Mexico. He apprenticed there and eventually started his own chocolate company in Somerville, Maine in 2005. He and his wife pioneered ethical cacao that is directly traded through the Direct Trade Cacao Certification program. This means they pay a premium for their cacao directly from the growers. They also have a great relationship with their growers that they have consistently maintained. The Taza Chocolate Mexicano Disc Sampler is a great tasting array of chocolates that will give you a great range of authentic Mexican style chocolate. This chocolate bar also tastes sweeter than most other dark chocolates that contain the same percentage of cocoa. Dark chocolate also is great for your heart, brain, and circulatory system as long as it is taken in moderation. Well, because this is chocolate, there aren’t that many cons. Chocolate is delicious. However, the price may be more than you would like to pay for chocolate. It is possible, though rare, to receive a melted product in the mail. Make sure you are checking that you have clicked everything correctly before you submit your order. The Taza Chocolate Mexicano Disc Sampler is a great product from an, ethically, very cool company. You are going to get a lot of different flavors of chocolate as well. The price is more expensive than a regular store-bought brand, but the quality and morality of Taza Chocolate makes that little bit extra feel like it went a long way. This chocolate is the real deal, and may be the exact product you are looking for if you want to spice up your snack time. If you want a wide variety of chocolate flavors, the Taza Chocolate Mexicano Disc Sampler is probably your product. However, it isn't the smoothest chocolate in the world because it is stone ground. If you have tried this product, let us know how you like it by leaving a comment. However, if you find that this product isn't for you, be sure to check out some of the other delicious chocolate options we have reviewed here at Green and Growing. Here are some top questions that I found for people seriously considering buying the Taza Chocolate Mexicano Disc Sampler. How many bars of chocolate are in this package? There are 8 different chocolate discs in this package. Is there just a standard chocolate bar in here? These should contain a regular dark chocolate and an extremely dark chocolate. Make sure you order the right one.